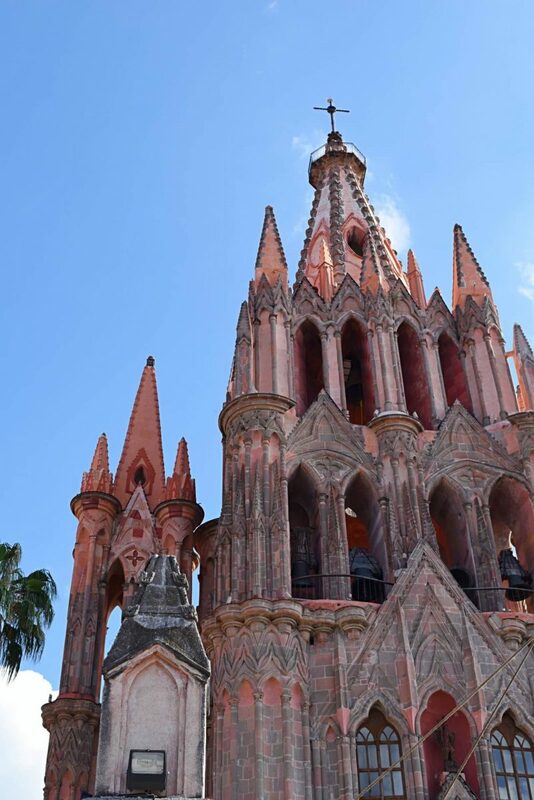 San Miguel de Allende is an absolutely beautiful colonial town about four hours north of Mexico City. I felt like I was in an Instagrammers dreamland with colorful buildings, blue skies, palm trees and cactuses everywhere. I constantly found myself stopping at bright yellow facades, cobbled streets, rows of potted plants along colorful rooftops, and flowers flowing down the front of different houses. 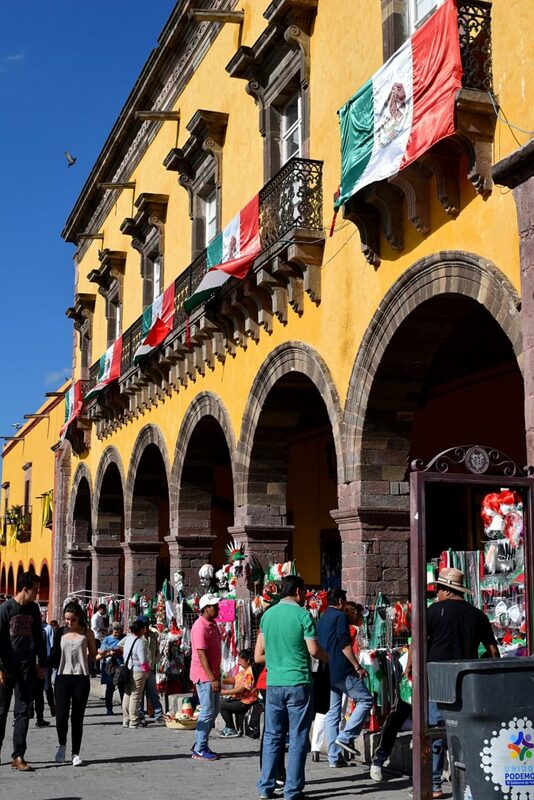 San Miguel de Allende has become something of an expat retirement town in recent years, but I was pleasantly surprised by how little that has affected the feel of the place. It’s a sleepy town with tons of art, shopping, and eating to do. This bright pink cathedral was apparently modeled after a Belgian church that the architect saw on a postcard. It’s really unique and I loved the outside. Beside the church is the main square called El Jardín. It’s a nice place to just sit on a bench and people watch. The square is surrounded by restaurants and street vendors. This is a really beautiful church with a lovely square to relax in. It’s much quieter than El Jardín, but there are still a few street stalls to grab a snack. I much preferred the inside of this church to the cathedral. It’s much more detailed and colorful. Simply referred to as the Bellas Artes, this is the community center and art school in the center of town. The building used to be an old convent and still has a lovely quiet feel to it. It’s completely open to the public and the gardens inside are a really nice place to relax. While we were there musicians were practicing, singers were serenading, artists were painting. It had such a creative buzz about it I wanted to spend the afternoon just soaking it all in! AKA the Botanic Gardens, is a beautiful 170-acre park just east of the town center. I read somewhere that you could walk, but after checking it out on the map, we decided to grab a taxi. Don’t walk. The road up to the park is SO STEEP. Seriously steep. A taxi from the center only costs 50 pesos (about $2.50). The entry fee when we visited was 40 pesos each (about $2). There’s a loop track that goes past a seriously stunning canyon, around a reservoir, and past tons of different species of cactus. It’s not what I imagine when I think of botanical gardens. There aren’t lush, green gardens full of colorful flowers. Instead it’s grey dirt and brown craggy rocks and green cactus, but it’s unique and interesting, beautiful in a totally unconventional way. This is a really lovely park at the southern end of town. There are walking paths and juice stands, a basketball court and plenty of benches in the shade. I really enjoyed simply wandering around the park, relaxing, and people watching. There are so many restaurants and bars in and around the center. Whether you’re traveling to San Miguel de Allende with kids, with picky parents, or as a foodie couple, you’ll find something for everyone. For such a small city, I found that there were SO many fantastic options around. I actually found that my favorite places were slightly out of town along Zacateros and Ancha de San Antonio. This is an amazing little brunch spot with freshly baked bread, fruit platters, homemade granola, and great Mexican breakfast options. It’s pretty well priced compared some of the more expensive restaurants around and it was nice to find a healthier option in town. If you just want a coffee, this is a great place for that as well. You can have it in or take away. This little market really reminded me of Mercado Roma. It’s like a fancy street food collective with pizza places, taco stands, bars, and juice stalls all under one roof with plenty of distressed wooden benches to pull up a stool at. I didn’t realize this was a chain, but this one seems to be something of an expat gathering place. That aside, the selection of Mexican craft beers is the largest I’ve seen in Mexico. It was great to get some recommendations from the staff and try some beers from San Miguel as well. Great bar with some really good food as well. 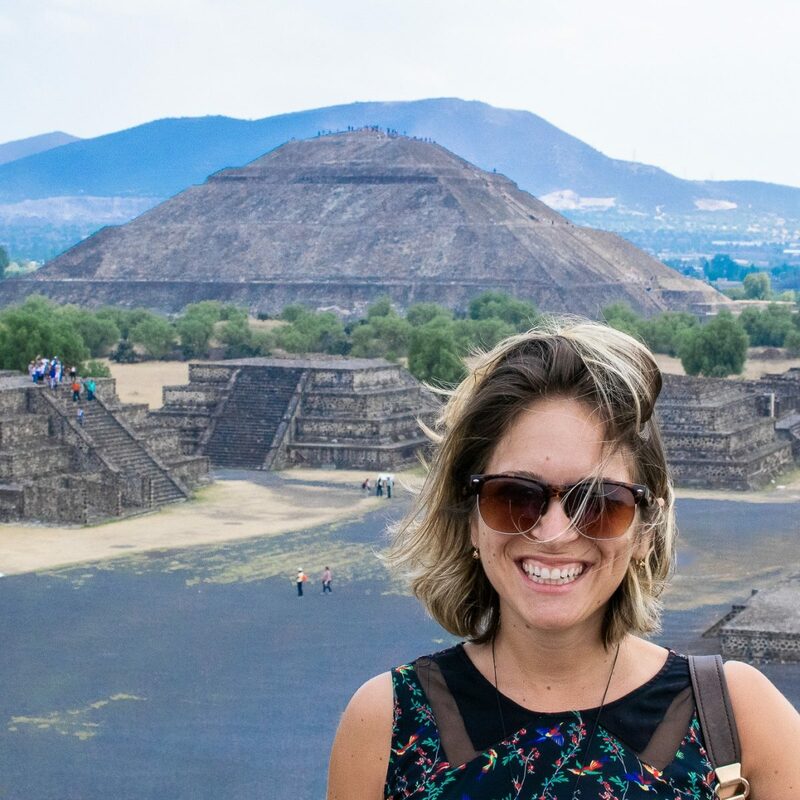 The atmosphere is one of the best parts – expats, locals and Mexican visitors mingle and the staff spoke English as well when we struggled to ask about certain things in Spanish. If you want to eat there for dinner definitely make a reservation! Otherwise, arrive early and grab a spot at the bar. Look for the food stalls all over El Jardín, the central square in front of the cathedral. There are different stalls there throughout the day selling tacos, quesadillas, tamales, hamburgers, and corn. Whatever the time of day you’ll find a snack in this area. San Miguel de Allende is a shopaholics dream. Every shop is full of local art, unique pieces from Mexican and expat designers, and plenty of color. This is the local’s market where you’ll find fresh produce, handicrafts, tacos, and all matter of tat. It’s a nice place to do some people watching and shopping. Great if you’re going to self-cater. This old fabric factory is worth the visit alone, but now a sort of fancy artist market, it’s a nice place to pick up some local souvenirs. The factory has been completely updated and there are several restaurants and cafes within it. Between the shopping and the caffeine fix, I easily spent an entire afternoon here. I sought this place out because I love the work their doing. All of the clothing is made by local seamstresses to help give local women financial independence. The clothing is beautiful and colorful. They use a lot of traditional Mexican patterns without it being the cheesy sort of stuff you find at the tourist markets. The quality is excellent for the price. As always, we turned to AirBnB and it did not disappoint(click here to get $35 off your first stay!). We stayed right in the center in this beautiful apartment that we had all to ourselves. It had a rooftop balcony where we spent most mornings enjoying our coffee and cereal. It was a short walk to all the sights and the owners couldn’t have been nicer. If you’re looking for a relaxing place to stay in San Miguel I highly recommend staying here. San Miguel de Allende is in the mountains at 1,900 meters (6,200ft). We visited in mid-September and the weather was absolutely perfect. Sunny and warm during the day, about 25 degrees Celsius (77F). At night it was slightly cooler and dropped to about 20C (68F). Similar to Mexico City, San Miguel experiences a rainy season from the start of June until almost the end of September. It usually means it’s quite warm during the day and then around 5 or 6 o’clock the clouds come and it rains for a few hours. Pack accordingly. It can drop to much chillier temperatures in the evenings during the winter months, but you’ll still enjoy really sunny crisp days with temperatures above 20C (68F) during the day. 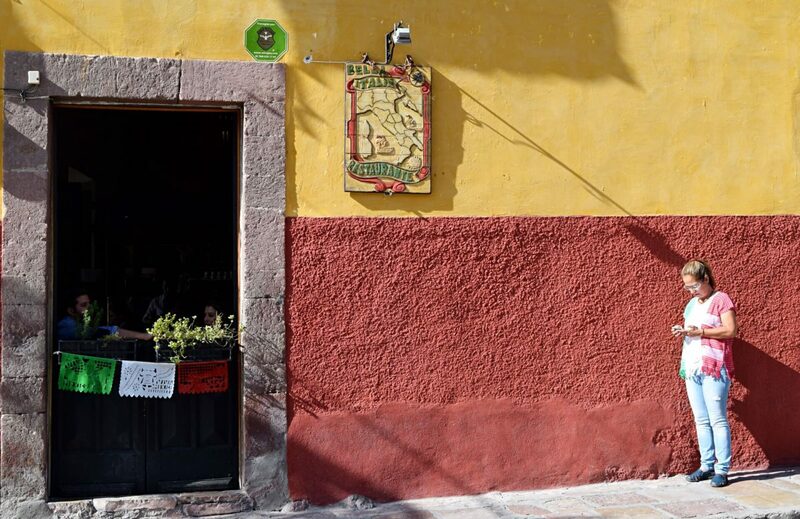 Getting in and out of San Miguel de Allende is really easy. From Mexico City, buses leave the Northern bus station every 40 minutes for most of the day. The better, faster, and more expensive bus company is Primera Plus. The ticket is 402 pesos each way. The cheaper, slower option is Coordinatos which costs 300 pesos each way. We took both of these and there wasn’t really very much difference except that Coordinatos makes a few stops along the highway to drop people off. From the bus station in San Miguel de Allende, you can take any bus that passes by into the center for five pesos or a taxi for 30 pesos. 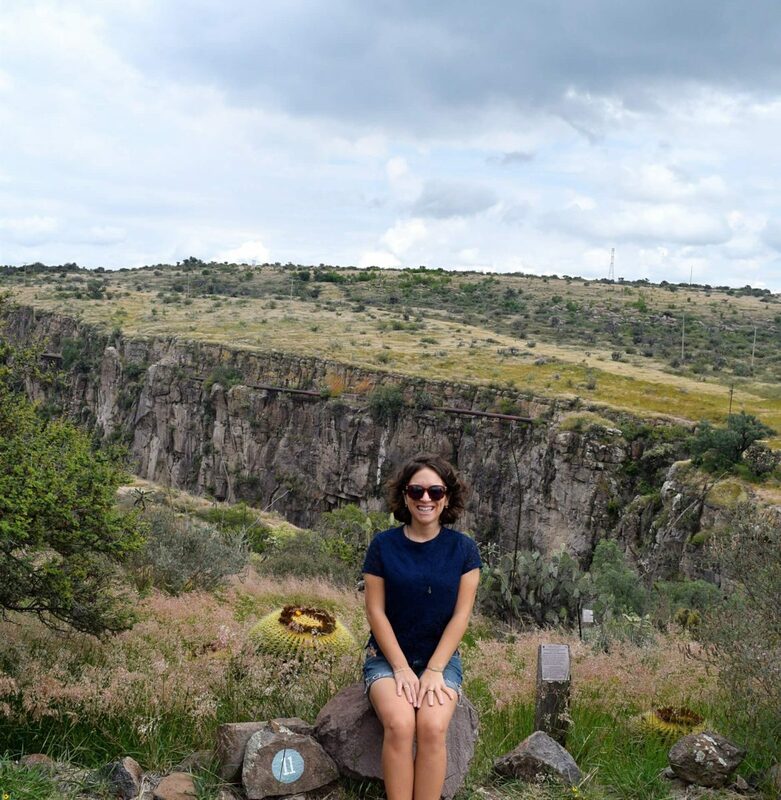 If you like this guide, you can take it with you by grabbing my San Miguel de Allende Excursion Plan. This post is sponsored by Excursion App, but as always, all love for San Miguel de Allende and it’s colorful buildings are entirely my own.